Whenever someone comes round to our flat, one of the first things they do is compliment the decor. It is very flattering to hear – but also makes all the effort we put in to make the place look nice worth it! Decorating a rented flat isn’t easy, but with a bit of hard work it is possible to make it look ‘Pinterest-perfect’. So today I thought I’d share my tips on how to decorate a rented property and make the most of your space! The main difficulty with rented properties is that there are elements you cannot change. The kitchen, the bathroom – you’re basically stuck with them. However, there are many simple ways to spruce up your living spaces to make them look a lot nicer. It just takes a bit of creativity and forward thinking! This is the cardinal rule of how to decorate a rented property. You have to live with the fact that there are elements of the decor that you cannot change. In our flat, the main issue for me is our headboard in the bedroom. It’s made of brown leather velcro (ugh) panels and to top it all off, has a lamp in the middle. Not exactly Pinterest perfect. However, this is something I can’t change about the flat. It’s built into the wall, it’s out of my hands. So I’ve tried to make do with it – adding lots of pillows and cushions to the bed to distract from it and hanging some fairy lights across it as well. It’s not completely #InteriorsGoals but it looks a lot better than it did before. So when it comes to your rented property, try to work around the things you can’t change. Horrible carpets? Find some pretty, large rugs to cover it up. Ugly sofa? Cover with blankets, throws and cushions to minimise the ugly. It’s amazing how much better a place can look with these little touches. This is another really important point. The main issue with decorating a rented property is that you can’t do anything that will permanently change the look of the place – for example, changing the wall colour or carpets. Some landlords might allow you to do more things with permission but to be honest, do you want to be spending your money doing up someone else’s property for them? Therefore, I’d advise only making changes that you can easily reverse afterwards. For example, only put up shelves that need small holes drilled in the walls and can be easily filled up once you leave. We’ve put up a few shelves in our flat, but plan to Poly-Filla them before our tenancy is up. Again, these small touches can make a big difference to the way your home looks but make sure you can take them away again easily! Now on to the creative part. With rented properties, I think the best way to add your own touch to the decor is with artwork. 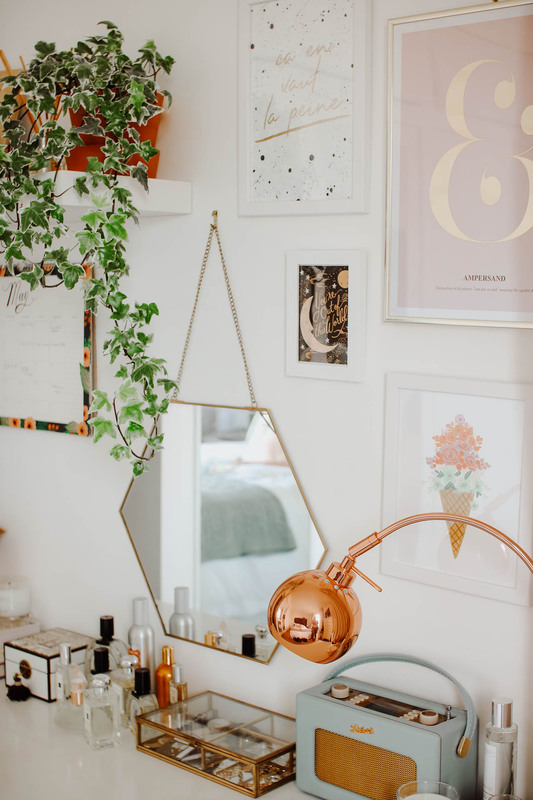 Nothing quite screams Pinterest interiors like a gallery wall, am I right? Use small picture hooks that will be easy to remove and fill before you leave and you shouldn’t have any problems with your landlord. 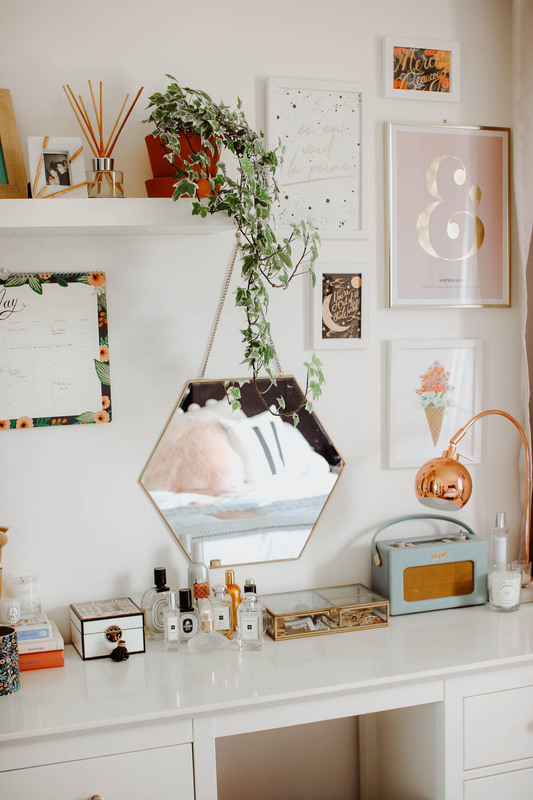 I’ve written a post all about planning a gallery wall which might be useful if this is something you’re considering! We have filled most of the blank spaces in our flat with artwork and it’s normally the first thing people comment on when they come over. 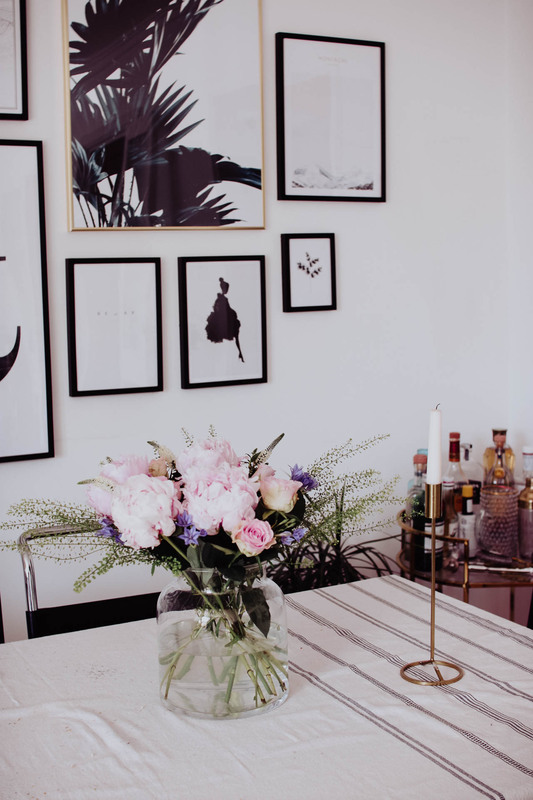 If you don’t like the idea of hanging artwork, or your landlord definitely won’t allow it, there are other ways of displaying prints without putting them on the walls. Leaning prints on shelves, desks and even radiators (watch out when they’re turned on!) can look quite effective. This is advice for those who rent furnished properties, rather than unfurnished. Furniture makes the biggest difference to how a home looks, but often the pieces that come with rented properties aren’t in great condition (or are just ugly!). What we’ve done is slowly build up a collection of smaller pieces of furniture that enhance the look of the our home, without forking out for large items like beds or sofas. I think this is a good idea for anyone considering buying a property in the near future, as it means you won’t be starting absolutely from scratch when you have an empty home to fill! But also, it means you can add your own personality to your home. Some of the pieces we’ve invested in are my dressing table, a coffee table, bar cart and wine rack. All of these fit into our flat perfectly and just lift the look of the place a bit. We’ll be taking all of these with us when we eventually buy our own house, so I see it as a good investment! I feel like this goes without saying, but I thought I’d include it anyway! Adding some greenery to your home always makes it look much more attractive – literally, a few plants can cover a multitude of sins! Personally, I love hanging plants like Ivy and String of Pearls. I think they look so stylish hanging off of a shelf or in a hanging planter! But larger plants are also great for filling up dull spaces, especially if you can find some nice pots to put them in too. IKEA is always a good bet for finding nice indoor plants, but I’d also recommend checking local garden centres if you have one near you. Finally, I think that fresh flowers can make any space a whole lot brighter. While I understand that flowers can be seen as a bit of an extravagance, given that they don’t last very long, I just love having them in my home. Normally I’ll pick up a few bunches on the M&S 2 for £6 deal, which isn’t too bad in the grand scale of things. Plus, vases can always be used decoratively when you don’t have flowers in the house! So those are my tips on how to decorate a rented property! I hope this has been useful and has given all my fellow renters out there some inspiration on how to spruce up your home. Interior design is so important to me, I just love chatting about it and could honestly prattle on about artwork and coffee tables forever! If you’d like to see more interiors content, I’d like to point you in the direction of my Instagram where I post about my home quite a lot! I’m always pinning interiors content on Pinterest as well if you’d like to have a browse of my boards over there. "Elderflower, Lemon and Mint Non-Alcoholic Spritz"